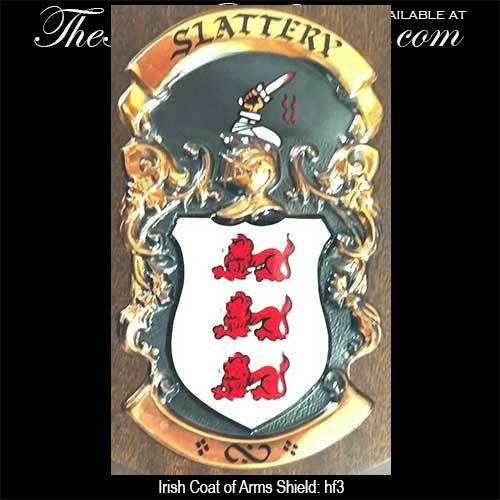 This coat of arms shield features an Irish family name. This selection of Irish coat of arms shields is limited to the names listed in the drop-down menu. These shields are from our early days of brick and mortar retail trade when we didn't require pre-payment on special order items; subsequently this group were never picked up. Please note that the shields are in pristine condition; however their respective gift boxes look worn and discolored. That is good news for you for they are 40% off while the limited stock lasts. This Irish coat of arms is hand painted on copper then attached to a mahogany wood shield. The colorful Irish coat of arms shield includes the family name along with the family crest and motto, when available (not all families have recorded crests and/or mottos). The Irish family shield measures 5 1/2" wide x 8" tall and is gift boxed with the blazon of arms that provides the heraldic details.